There is a moment within the opening credits of Disney's latest attempt to turn one of their classic animated properties into a live action ATM that hints at the devastating nature of our lives. It is fleeting and it, if only for a moment, says all it needs to say about what this movie aspires to be. As it passes though and as it becomes more and more apparent the film doesn't really know how to accomplish what its initial ambitions intended the film instead becomes all the more broad and all the more safe. This moment is one in which a young Christopher Robin (Orton O'Brien) comes to the Hundred Acre Wood for the last time. He is going off to boarding school, you see, and won't be able to visit his friends as often anymore. 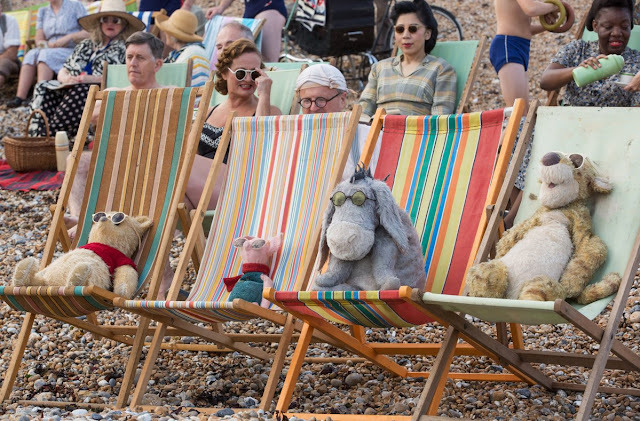 His friends being his stuffed toys, which include that silly ol' bear named Pooh (voice of Jim Cummings), the perpetually petrified Piglet (voice of Nick Mohammed), the ever-exuberant Tigger (also Cummings), the steadily gloomy Eeyore (voice of Brad Garrett), as well as Rabbit (Peter Capaldi), Kanga (Sophie Okonedo), her little Roo (Sara Sheen), and of course Owl (Toby Jones). Robin's toys know change is afoot and are throwing Christopher a farewell party of sorts in which treats-ranging from pots of honey to carrots, of course-are served and where even Eeyore is moved to make a speech. It is in light of the depressed donkey's surprisingly apathetic speech that Rabbit reacts to accordingly that we hear Cummings as Winnie the Pooh whisper a soft, "I would've liked for it to go on a bit longer." And just as fleeting as the moment itself is it simultaneously felt as if I'd been knocked over by a half ton barrage of scattered thoughts and emotions that reminded me just how fleeting time itself is. It's the one thing we can't get more of no matter how much wealth we possess or the circumstance of our lives; we all have a finite amount of time and Christopher Robin, in its first five minutes, exists to remind you that your children will grow and change just as you did and even though you feel you're different, that you're special, and that despite knowing it was a fact of life all along you were never really meant to grow old and become like your parents before you. Time truly waits for no man. This affected me to the point I wondered why I was sitting in a theater watching a movie when I should have been at home snuggling my three year-old daughter. In short, that would have been the more entertaining option of the two and certainly the more fulfilling one as it is only in this aforementioned moment that Christopher Robin was able to pull any genuine feeling out of me. And might I remind you, this is a movie wholly designed to pull on the heart and nostalgia strings. One moment. 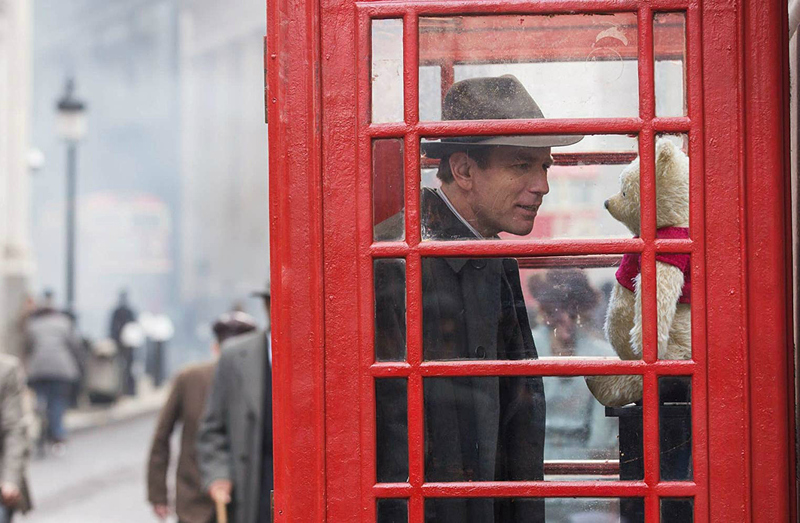 Christopher Robin (Ewan McGregor) finds himself in an odd position when Winnie the Pooh shows up in London. Deep in the Hundred Acre Wood, this fictional land inhabited by Pooh and his friends, is where we initially meet the cast of well-known characters in director Marc Forster's (Finding Neverland, Monster's Ball, Quantum of Solace, World War Z) film, but we don't spend much time here over the course of the next ninety or so minutes as Christopher Robin quickly enters the real world first showing us in montage how our titular character comes to stray so far from the childhood that has seemingly brought so much joy to so many other's childhoods. Beginning with boarding school-and a very telling shot in which Robin's father turns his back to walk away as soon as he's hugged and told his son goodbye while his mother stands for a moment longer, watching her son walk away-onto having to become the man of the house at a younger age than most, into the fact this young boy who we've always pictured as something of a Peter Pan-like touchstone actually served overseas in the war for several years away from his pregnant wife, Evelyn (Hayley Atwell), therefore missing the birth and early years of his daughter's life. It's a lot to take in especially given the amount of time in which the film delivers it, but more interesting is the fact any point in these events would have made for a more satisfying experience in terms of what the movie wants to do, but instead of having Robin hit rock bottom-losing his sense of childlike wonder completely-during the war the screenplay from Alex Ross Perry (writer/director of such indie darlings as Listen Up Philip and Queen of Earth), Tom McCarthy (writer and director of the Best Picture-winning Spotlight), and Allison Schroeder (whose first feature screenplay made into a film was Hidden Figures) instead decide that the film's namesake will have this crisis of identity post-war when he's stuck in an office doing mundane, day to day tasks because "Hey! At least the war was unpredictable!" This may be the most "movie" thing this movie does, but this has a lasting effect on the film as the biggest issue Christopher Robin runs into is being a movie about the purity and preciousness of childhood and yet it never feels authentic. Everything about from how the scenes are stitched together to the very example-like nature that each of the situations possess lend the overall impression of a series of contrivances rather than a genuine truth that conveys the thesis of the pitch that adults too easily lose sight of a child's perspective including the multitude of joys that can be found in the world if we alter how we look at it. Forster is a diverse director, but in less and less of his more recent efforts has he seemed to be able to find his own sense of footing or who he is as a filmmaker. It's admittedly been some time since I've seen either Monster's Ball or Finding Neverland though he will always have my favor and optimism thanks to Stranger than Fiction (I need to see The Kite Runner), but while it was those early films that marked Forster's arrival on the scene and as something of a formidable force to be reckoned with he was then snatched up by the studios to direct pre-destined tentpoles such as the next James Bond. 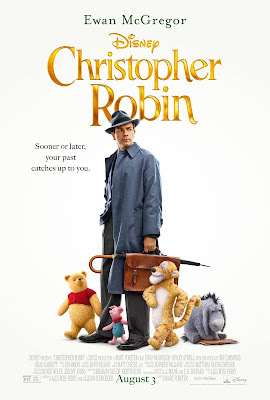 It's easy to see how his career trajectory went astray after this, but with Christopher Robin it seems he might have landed on a project that would allow that footing to once again be surer of itself. And while there are components, arguably the most critical of components, that work well and bring the aimlessness of the plotting and the lack of efficiency (ironically enough) in the pacing up to levels of charming and more consistently funny than expected after the slog the first act turns into the movie itself ultimately never has any stakes that are worth getting involved in, has a message and main idea that should be fairly obvious to the main character, but that he doesn't fully give into until the third act when he's supposed to give into his epiphany despite long-since realizing the lesson he's intended to learn. Worse, none of these actions ever truly gel with what the movie really wants to say. There is this line that is repeated often by Pooh that goes something like, "doing nothing often leads to the very best something," and though there is certainly flaws to be found with this nugget of wisdom it might have been beneficial had Forster taken cues from his characters. Christopher Robin is aimless because it tries to do so much at once, throwing multiple character arcs and conflicts at the wall, but never giving any of it enough weight to the point it amounts to anything. There is a bit with the Robin's weird neighbor who keeps insisting he and Robin have a game of gin rummy, but this goes nowhere and is ultimately nothing more than something thrown in to get a laugh. The likes of Atwell and Bronte Carmichael who plays their daughter, Madeline, are more or less wasted and serve simply as reminders of how much Robin is messing up and how much he is missing. Christopher Robin is oddly paced because it largely wraps up its core story in an hour and then has to go on for another forty minutes so that the title character can repeat his arc and Madeline can fill in the role once played by her father in regards to his toy friends. Oddly enough, this redundant final act is the only time the movie possesses some forward momentum. Essentially, should Forster's Christopher Robin have less distractions filtered through it the characters themselves might have been more in tune with the film's very visible heart. Pooh (voice of Jim Cummings), Piglet (voice of Nick Mohammed), Eeyore (voice of Brad Garrett), and Tigger (also Cummings) enjoy some fun in the sun in Christopher Robin. Being a story about how Christopher Robin becomes so lost to the point it is difficult for his own child to imagine him as a child though, the most critical of elements that would need to be pulled off in order for even the single most innocent member of the audience to buy into the fact Robin could make the realizations he needs to make in order for viewers to feel as if they've been taken on a journey is that of the credibility and connections of those inhabitants of the Hundred Acre Wood. We needed to care about Winnie the Pooh and his make-believe friends and believe in their ability to serve as not just reminders of who Christopher Robin once was, but as symbols of what he'd lost in the course of growing up. It is in this course of action that Forster and Christopher Robin as a whole succeed the most. This is a very handsome film, a gorgeously rendered film, if you will, as each of the characters we all know and love are depicted as something of a balance between the animated incarnations most will associate them with and the real-life dolls of the real-life Christopher Robin and his father, author A.A. Milne. Forster and cinematographer Matthias Koenigswieser create this warm and comfortable aura with a soft sun luminescence within the Hundred Acre Wood that lends the realm something of an ethereal element whereas Robin's London-based job and home life couldn't be drearier or more drained of color. The aesthetics of these dolls come to life in truly tangible ways and their interactions with both real-world environments as well as, when Pooh makes his way to London, real-world people are what give the film a much needed vibrancy. Pooh will rattle off little sayings like, "It's always a sunny day when Christopher Robin comes to play," but in the case of this movie it is more the opposite for it is when we get to see cute little Piglet try to hide, but be tempted by the thought of acorns, or Eeyore float down a river with no hope of being saved, or even when the movie blatantly pays fan service by having Tigger perform his trademark song that the most joy comes off the screen and we, the viewer, are ourselves reminded of what made our childhood so magical. This isn't to say Ewan McGregor isn't fine enough as the titular character, but he's simply strapped with so much of the dour material that he can't help but to pull down both the energy and the tone. 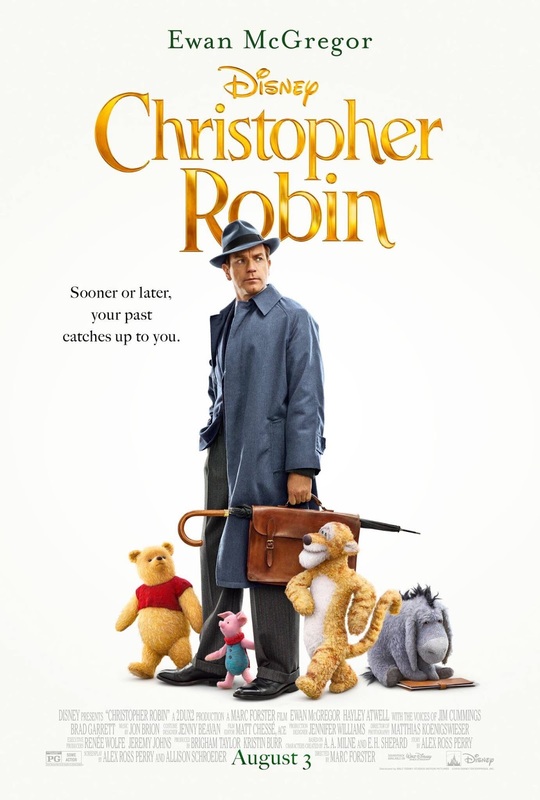 The challenge with Christopher Robin was always going to be how to make it more than just a nostalgia trip though, and while it might have yielded a better, more insightful movie better in tune with its feelings and ambitions had Disney maybe allowed Perry to direct a script he wrote by himself based on the given premise what Forster has crafted here is a very nice, very quaint film that hits its necessary marks, but is far too slight to ever reach the emotional heights it's scaling.